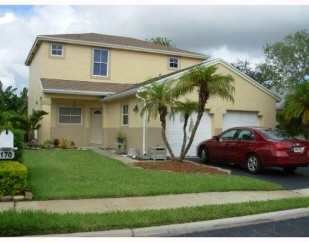 This beautiful, neat, clean, two-story home is located in a great sub-division with maximum security. The roof is new and the two-car garage is very convenient. Yard care, basic cable, water and HOA Fee included.There is a chandelier in the dining room and recessed lighting in the living room.All of the bedrooms are upstairs for high quality privacy. The back yard is fenced, and the front yard is nicely landscaped. This property is located in a great neighborhood near great schools, new shopping and dining area, new hospital- Miramar Memorial Hospital and close to highways. A must see! Multiple year lease is ok.